Implementing an effective user experience strategy for your organization will take more than a good effort from your UX design team’s leadership. You’ll need the support and understanding of every group involved in the product’s definition and delivery. You’ll see the most success from your UX strategy when the leaders of those teams buy into a plan you collaboratively come up with. Some design leaders try to accomplish this by creating their strategy in isolation, then deliver it to the other product team leaders as a done deal. This approach rarely gets buy-in from those other team leaders. We’ve found a better approach: bring all the leaders together to hammer out a strategy everybody feels ownership of. You’ll get the most out of our Creating a UX Strategy Playbook workshop when you bring the right people along. The great thing about our workshop is you can bring folks with any level of understanding about UX design. Even those who have only a vague appreciation of the benefits of good design. It’s ok if they walk in thinking that UX design is something that happens at the end of the project to neaten and pretty everything up. We’ll help them get a deeper understanding. Everyone who comes to the workshop realizes the strategic power of thinking about their users and what they need. They see how UX design is more than nice colors, clean layouts, and modern typography. They learn how a UX design strategy is essential to solving your users’ big challenges, while also dealing with the real-world project constraints. Don’t worry—this is a business workshop, not laden with designer jargon. Everyone will follow along, because we define every strategy and method. You will all leave the workshop with a common language and deeper insights into UX’s benefits. This will help you implement your strategy when you return to your organization. The Playbook workshop is about UX strategy, so of course you should bring your UX design leadership. You’ll get even more value when you bring the leaders of product management and development. For your product leadership, we’ll focus on how a great UX strategy makes a product manager’s job much easier. They’ll walk through the best methods for dovetailing the UX strategy with every key product initiative, strengthening both in the process. They’ll get the ammunition they need to push back on arbitrary high-profile customer requests and unreasonable delivery dates, ensuring their team builds the right product that meets the needs of all users. The development and engineering leadership who attend will immediately see how a great UX strategy makes their life easier. They’ll learn how their skills and knowledge can deliver better user experiences from the start. They’ll discover why it’s best if the UX design team is brought in earlier in the process. As a design leader, bringing your peers from other parts of the product development organization to the workshop will make a huge difference when you start implementing your UX strategy. You’ll have their commitment to your strategic plan, with support across the entire product team. Great products don’t happen because the organization hires a Justice League of Super Designers. Your organization will deliver great products because the teams collaborated by following a cohesive UX strategy. 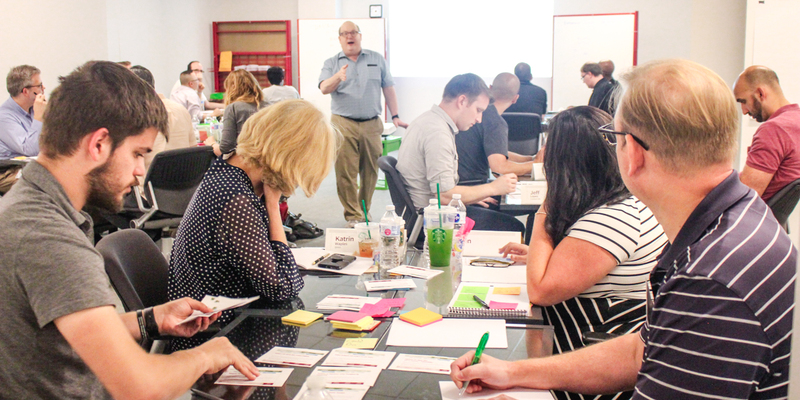 Our Creating a UX Strategy Playbook workshop is the perfect place to strengthen vital team relationships. Attend the workshop together and leave with a team ready to take action and deliver better designed products. Bring your team to next week’s Creating a UX Strategy Playbook workshop in ThoughtWorks’ Manchester, UK office. (Most teams come with four members, so bring your team of four or more.) We also have upcoming workshops on Dec 12-13 and February 6-7 in our Chattanooga, TN USA classroom. Let’s work to collaborate together and create your team’s cohesive strategy. Register today at the Creating a UX Strategy Playbook workshop website.